In early 2014, I was inspired to make it a goal to have something I write turned into a movie. I felt inspired by watching one movie in particular: Winter's Tale. I really enjoyed the voice- over in the beginning of the film and at the end of it as well. 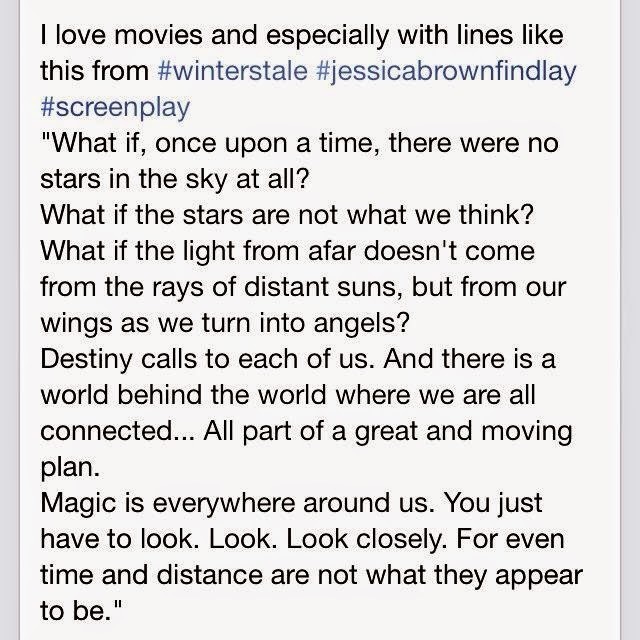 Below, at the end of article, are a couple of pics with some lines from the movie which really impacted me as a writer. It's those kind of lines that I find truly inspirational and moving so much so that I want my writing to impact readers or audience members as well. Writing that keeps your attention and touches your heart. The lines impacted and motivated me to dig a little deeper and to pursue a passion that I didn't realize was in me until later. Of course other films have impacted me like "Braveheart" and "Love Actually" (just name a couple), but not to the degree that this one did or maybe it was all about the timing of this movie. I don't know exactly why now in this time of my life I am pursuing a very competitive arena of writing except to say that I felt compelled to go for it. I now tell people that I'm a SCREENWRITER in addition to being an author of children books. I love writing my children books, but I know there is so much more that I want to share with the world. 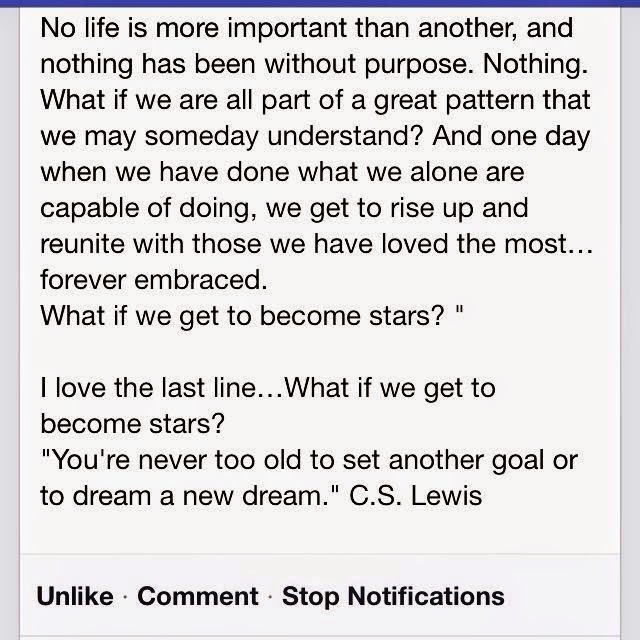 For some reason, the lines "What if we get to become stars?" from "Winter's Tale" resonated with me, and I'll freely admit I did become a little emotional from them. From the website, here's the synopsis, so you'll have a clue to what it is about: "The movie is set in a mystic New York City and spanning more than a century, "Winter's Tale" is about miracles, crossed destinies, and the age-old battle between good and evil." Colin Farrell, Jessica Brown Findlay, and Russell Crowe starred in it. The film is based on the novel by Mark Helprin. I encourage you to watch it, and please comment later on what you thought of the movie. I knew that if I wanted to be a screenwriter then I would have to learn about it. Around March of 2014, I was scrolling the news feed on Facebook and saw that one of my friends liked a page titled: The PAGE International Screenwriting Awards. I thought, I'm going to check that out, and so glad I did. It's a page filled with a wealth of information for screenwriters as well as a yearly contest and quotes to inspire you in your dream. It's been beneficial to me on this journey of mine. I often share links and quotes from that page to mine on my Facebook. I was encouraged by this same friend to write a screenplay, and I was like : me? He was like: Yes you. He didn't think my dream of wanting to be a screenwriter was crazy. I thought my idea was crazy and out of my comfort zone too, but he didn't. He quoted this to me: "The ones who think they are crazy enough to change the world are the ones that do." I think I am crazy enough....lol! So, I've written two small ones so far, and writing more. Below are some comments by Joss Whedon , an American screenwriter who wrote "The Avengers", from an article by Allanah Faherty from Movie Pilot News. "Embrace Your weirdness. Normal is boring, no decent movie was ever written by a normal person. There's a reason all the best filmmakers are often classed as kooky or crazy, and that's because they have a point of difference: their weirdness. Embrace it, nurture it and use what comes from it to create wonderful things. It is after all, your greatest asset." Those comments were encouraging to me! My sister, Lori, has often called me eccentric which is just a fancy word for weird. So, if I'm considered weird then I'm going to embrace and nurture it. Weird is at least not boring! I hope you'll follow me on my journey of screenwriting. I've written two short screenplays and one other that's over forty minutes. I'm a Screenwriter Dreaming to make it big! It's scary, but I'm excited! There's also a saying that goes: If your dreams don't scare you, they aren't BIG enough.